Dubai is filled with ultra-luxe, high-end attractions, with an ever-growing list still to launch. But, if it’s something simpler you’re looking for, why not check out Dubai’s ‘Love Lakes’, a stunning new attraction in the desert. Found in Al Qudra, you’ll find two man-made lakes which have been shaped into two interlocking hearts. Dubbed ‘Love Lake’, if you fancy checking it out for yourself, you can find it on Google Maps here. 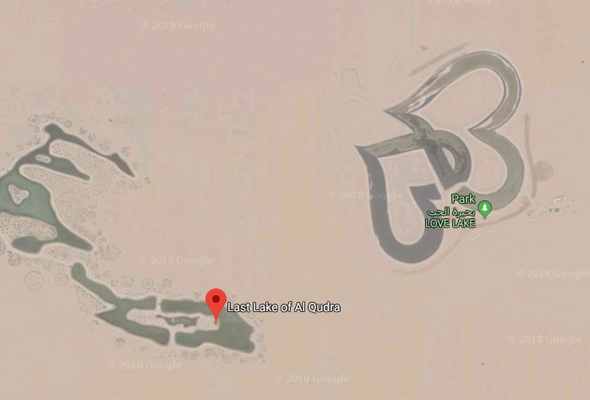 The Love Lake is a short distance from the Last Lake of Al Qudra, and if it wasn’t romance-inducing enough in the shape of a heart, ‘Love’ has also been spelled out in trees next to it.